When I first met Judy, I could tell that she was a great person. She welcomed me into her house, offered me something to eat and a cup of coffee. I felt like I was walking into a home of one of my relatives, I was so comfortable yet it was the first time I was meeting her. Judy is my husband’s aunt. I was at her house for a big 4th of July Party with all of her family. Judy married into a big Italian family. Like a typical Italian gathering, there were so many people and an abundance of food. It was just so impressive to see that many generations of a family gathered in one place. Judy is a talented cook and baker. I am always impressed with the massive amount of food that comes from her kitchen. If there is a family event at her house, there is always a plethora of hot dishes that comes from her oven. I ask her in jest where does she hide the multiple stoves in order to produce this much food. She smiles and laughed because Judy is also of Italian descent. Like many Italian woman who have already raised their family, Judy knows how to cook for a large crowd. She is a pro, and has been cooking and baking for many years. It was at this gathering that I first had her zucchini bread. When I first bit into it, I was completely hooked. I do believe I let out an audible “yum” sound while devouring down my first piece. I told Judy that this was so delicious and it was the first time I had ever eaten zucchini bread. Yes, I know it is hard to believe that a person could be in their late twenties and have never eaten zucchini bread before. Judy laughed at my revelation and told me that she would share her family recipe with me. She told me that the recipe “was a simple one and that she has been making this for years”. Before I left, as promised, Judy had written the recipe down for me. As she hugged me good-bye, she told me that “I could call her anytime if I had questions about the zucchini bread recipe”. Pittsburgh has the perfect environment for zucchini to grow. In the late summer when it is plentiful, I soon put this new recipe into my baking repertoire. My family tended to like a spicy version of this bread, so I played around with this the spice combinations. I like to use cinnamon and nutmeg, however ground cloves and ground ginger work well in this recipe too. (See this article for more information on cinnamon). 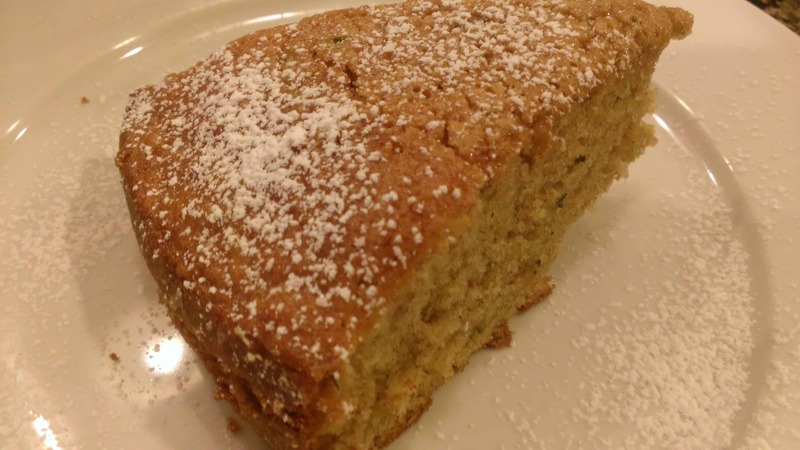 I have been making zucchini bread for many years since receiving the original recipe. It makes a delicious moist bread that is perfect for a snack or breakfast. It is also the prefect recipe for beginning bakers to start off with because it is not complicated. I have included my recipe for Spicy Zucchini Bread. Here are a few tips that I have learned along the way that I would like to pass along. Make sure that the zucchini is drained before you mix it in the batter, if not it can add extra liquid to the batter and cause your loaf not to bake properly. If you happen to get an extremely large zucchini, I just remove the seeds and use the skins only. The large seeds tend to leave a bitter aftertaste in the bread. I tend to double the batch and freeze the loaves; they really freeze and defrost nicely. They will last for about a month or two in the freezer if they are double wrapped in aluminum foil. Lastly, because I do make so many at a time, I use cake pans to bake the bread in as well as loaf pans. The baking times changes slightly, I just bake it until the center comes out clean on a toothpick. Every time I whip up a loaf or two of zucchini bread, I always think of Aunt Judy and meeting her that day. Now we all can make these breads and bring smiles to my family and friends just like she does. 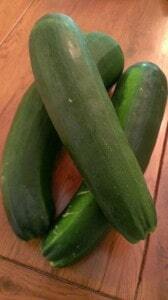 2 cups zucchini, grated and well- drained. Mix together eggs, oil, sugar, zucchini and vanilla. Set aside. Mix together flour, baking soda, salt, nutmeg and cinnamon. Add this to the first mixture. Pour into 2 greased and floured loaf pans. Bake 350 degrees for approximately 45-50 minutes. Or until the center springs back when touched (until toothpick inserted in center comes out clean).